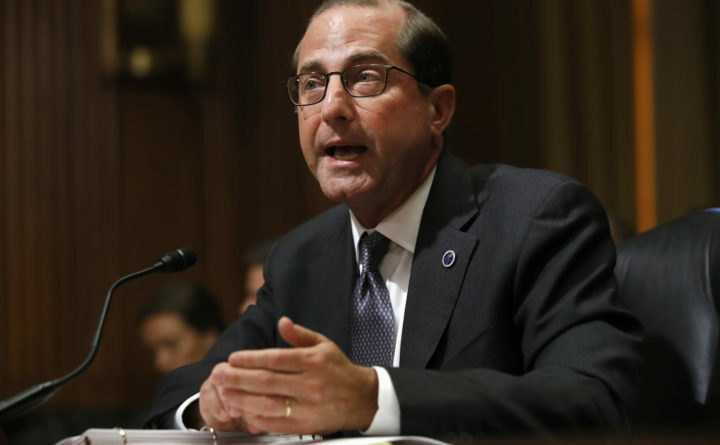 In this June 26, 2018 file photo, Health and Human Services Secretary Alex Azar speaks on Capitol Hill in Washington. A DEA report obtained by The Associated Press shows heroin, fentanyl and other opioids continue to be the highest drug threat in the nation. The National Drug Threat Assessment will be released publicly later Friday. Azar said earlier this month that overdose deaths have now begun to level off. But he cautioned it is too soon to declare victory. WASHINGTON — Drug overdose deaths hit the highest level ever recorded in the United States last year, with an estimated 200 people dying per day, according to a report by the U.S. Drug Enforcement Administration. Most of that was the result of a record number of opioid-related deaths. The DEA’s National Drug Threat Assessment, which was released Friday, shows that heroin, fentanyl and other opioids continue to be the highest drug threat in the nation. But federal officials are concerned that methamphetamine and cocaine are being seen at much higher levels in areas that haven’t historically been hotspots for those drugs. The DEA is also worried that people are exploiting marijuana legalization to traffic cannabis into the illicit market or to states that don’t have medicinal or recreational-use marijuana laws, according to the report.